This is a rather intimate variation -- any more intimate and they would be kissing. The gentleman has his left arm resting lightly between the lady's shoulder blades, while she has both hands on his shoulders. They stare intently into each other's eyes and rotate slowly. 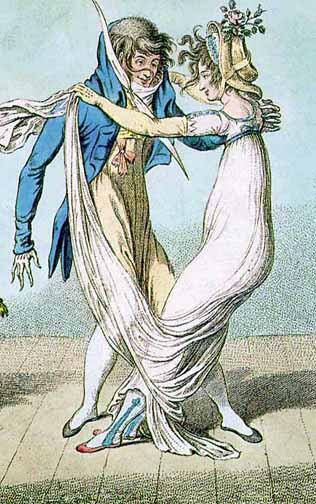 The foot position is interesting, and suggests that their feet are almost intertwined while their bodies are leaning back a little bit - though he does not seem to be taking her weight with his left arm.